It's easy to forget how old martial arts are, as a form of self-defence and sport. Some, such as Karate or Muay Thai, are over a thousand years old! Kickboxing as a separate sport is much younger in comparison as the first mentions of kickboxing are from around the 1960s. The sport then evolved, more resembling the form we know today, and became more popular in the 1970s during which the Professional Karate Association (PKA) held the first World Championships in Los Angeles. This is the modern history of the sport however; the roots of its invention are actually formed over a thousand years earlier in the form of Muay Thai. Most martial artists recognise a strong link between Thai boxing and Kickboxing, sharing many techniques and the sparring style also displaying many similarities. Thai boxing was actually created in the 13th- 14th centuries by the Siamese soldiers of Thailand as a form of self-defence and was first known as Muay Boran. It was still used for defensive and combative purposes up till the 1800s when, as a result of unarmed combat in war becoming less effective it became more of a true sport, used for fitness and recreation. It developed a set of rules and the use of more equipment to make the sport safer was introduced, such as gloves. These developments continued over the century and by the 1920s it had largely become known as Muay Thai and shared many similarities to the sport we know today! Osamu Noguchi, a Japanese expert of boxing, is the person credited with actually creating the name ‘Kickboxing’ during the 1960s. Allegedly he came across the martial art form of Muay Thai and had the idea to combine this fighting style with parts of Karate and Boxing; creating the first form of what we know today as kickboxing. A few years after this the ‘Kickboxing Association’ was formed in Japan, which was the first ever Kickboxing organisation! In the years after the sport was invented it then changed and adapted to become a better, more complex and more entertaining martial art. When kickboxing was still quite new it progressed as part of a trial and error process. The majority of those who tried it came from a Karate based background and fighting for 10 rounds in full contact appeared to be a difficult adaption from the Karate style to begin with. Most required better fitness levels and had to change their techniques to increase their effectiveness in full-contact sparring because a lot of contemporary schools did not train or spar using gloves and also most students were taught to pull back their punches and kicks. Influences were also drawn from Western Boxing with regards to the fighting, conditioning and training. In competitions it was originally on a standard Karate surface (i.e. not in a boxing ring) until the 1970s when there were only 4 separate weight divisions at the time. The sport only really became popular in Europe in the late 1970s when the WAKO (World All Style Karate Organisation) was created by the German Georges Brucker and was popularised by the famous martial artist, Bruce Lee, when he appeared in various films showing off his talent! At the EKA we recognise the uses of all styles of martial arts as this recognition is what makes each style of fighting adapt and evolve to become even better. Lots of older martial arts such as Karate and Taekwondo can focus on discipline within teaching which is good in many ways. While kickboxing still implements elements of discipline, it also brings a new feeling to the sport, that of healthy competition and a drive to be a brilliant fighting style; adopting techniques from many sources. 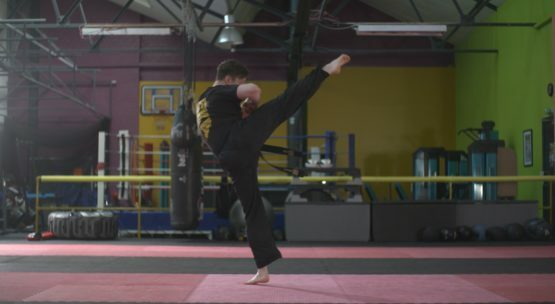 Kickboxing is about using your agility, reflexes and energy to overcome your opponent over a period of time, the action-packed fighting style making it one of the most exciting sports of the modern age. Muay Thai became the national sport of Thailand and remains in that position today. A Thai fighter is treated the same as a premier league footballer would be in the UK or a basketball player in America!